Gloria Dei Lutheran Church, St. Paul, Minn. I believe art has been my passion, my work, my inspiration and sometimes my healer. It has always been part of my life. The arts are a higher level of human activity—the opposite of violence and chaos. Every community needs the arts, as it’s part of God’s creation. Art provides balance in my life along with family, community and church activities. Art gives me a separate identity—a place of my own—while at the same time I’m able to share it with others. I pray to see and interpret God’s creation. I pray that the gifts given to me will grow and develop so I can give back to others and reveal God. My favorite church memory is an early childhood memory of singing in the choir at the early Easter service and walking to church in the dark. My time as an artist-in-residence at Holden Village, a retreat center in Washington, was a valued experience. I considered it a calling. What a privilege to be part of that community and to have time to do what I loved in such a wonderful place, and to have my family with me too. Faculty came from seminaries and colleges and enriched my life. There was so much offered—lectures, concerts, hikes, prayers and worship services. I find grace in the process of painting. I’ve had the experience of being in an atmosphere where it’s as if some other presence guided me and gave me energy. I wasn’t alone in creating, and the painting wasn’t mine alone. To me, this creative spirit is part of grace. I designed an Easter altar hanging for my congregation in 2013 that expresses God’s great power and love that could accomplish a resurrection. The design has a joy to it and gives a warm welcome after a cold winter. When the drawing was first approved by the committee, I said to God, “We did it.” Prayer was part of the process. I find grace in the process of painting. I’ve had the experience of being in an atmosphere where it’s as if some other presence guided me and gave me energy. Through 56 one-woman shows and teaching at several universities, I’ve had a long art career. Art was always part of my life, and I had a desire and a need to express myself in line, color and shape in art forms. I interpret God’s creation not as a camera but as an artist—seeing and experiencing God’s energy, inventiveness, variety and beauty. Exhibiting my art is giving back and sharing my growth. I’m fulfilled knowing that I could bring joy to others with something I loved to do. Persistence of Vision, a book of my art that Afton Press published last year, covers my art career well and is also a story of the artist as a wife and mother. The author is an art historian and writer, and she could evaluate the art in terms and values. I’m a Lutheran because I feel there is a certain freedom in Lutheranism in how we make faith personal—directly to God and Christ—and how we can practice it in our daily life. There’s also a freedom in how we interpret Scripture while still having a commitment to creeds. I also love how our music is so important and well developed. I can connect my faith to my art in forms and color. I work honoring God’s creation in my own way. It’s a gift to develop and give back, and it was an honor and challenge to create the Easter altar hanging at Gloria Dei. I was pleased to express my faith in color and design. It’s important for churches to hang original art. People are surprised that I combined an art career with a family, community activities and church. 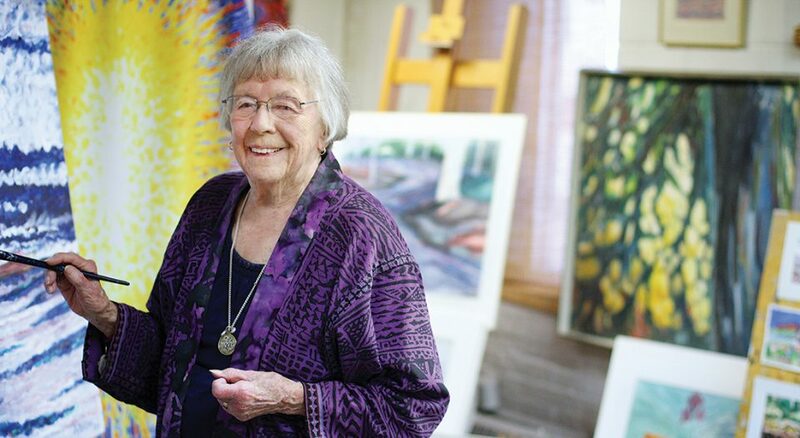 I had three children in the ’50s, and I realized I needed to keep up my art, get out of the house and be in an art environment. I needed to develop my own language and style. My interest in painting began early. I was always drawing. As a teen, it was fashion figures. My high school art teacher encouraged my expressionistic direction. That gave me confidence to be different from others, to be original. Sentence prompts are provided to each person featured. If you’d like to nominate someone for “I’m a Lutheran,” email megan.brandsrud@elca.org.